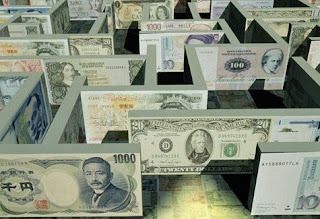 In the former part of this article, I have already covered on the 1983 – 2002 banknote series introduced by the Bank of Korea, in which this older series of banknotes is still legal tender in South Korea. In this latter part of the article, you can then read on to find out about the latest series of banknotes issued by the Bank of Korea since 2006 up to now. Basically, the banknotes introduced by the Bank of Korea from 2006 up to now include the ₩1000, ₩5000, ₩10,000 and ₩50,000 banknotes. 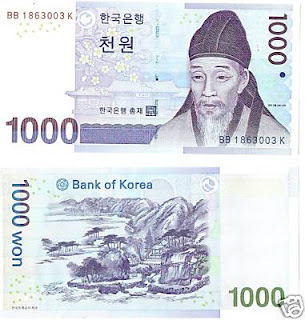 The above is the 1000 won, or ₩1000 banknote. First issued in 2007, it is classified as Series III by the Bank of Korea. The portrait on the obverse side illustrates Scholar Yi Hwang, of whom I’ve mentioned before. At the centre of the banknote, printed with a lighter shade of colour, one can see the picture of the Myeongnyundang (명륜당 / 明倫堂), which is part of the Seonggyungwan (성균관 / 成均館) in Seoul. First established in 992, the Seonggyungwan somewhat functioned as the national academy, university and the leading institution of education during the Goryeo and Joseon Dynasties of imperial Korea. Its education primarily revolved around Confucian teachings and Chinese classics, preparing its students for government service. After South Korea gained its independence from Japan in 1945, this institution gave rise to the modern Sungkyunkwan University (성균관대학교 / 成均館大學校, seonggyungwan daehakgyo) in Seoul, which currently exists alongside the traditional buildings of the old Seonggyungwan. The Myeongnyundang, on the other hand, is a traditional building within the Seonggyungwan which functioned as the main lecture hall where classes were held during the imperial era. Scholar Yi Hwang graduated from the Seonggyungwan and also served as a priest, educator and administrator in the same institution several times. Besides these two features, there is also an illustration of plum blossoms on the obverse side of the banknote. The plum blossom was a plant that Scholar Yi Hwang personally held in high esteem, in which the plant itself represented his graceful personality. 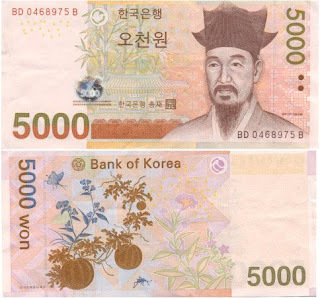 This is the 5000 won, or ₩5000 banknote. It was first issued in 2006 and is thus classified as Series V by the Bank of Korea. The obverse side displays a portrait of Scholar Yi I, of whom I’ve mentioned before as well. At the centre of the banknote, there is an image of the Ojukheon Residence printed with a lighter shade of colour. As I’ve mentioned before as well, the Ojukheon Residence is the birthplace of Scholar Yi I. Behind it, one can also see an illustration of black bamboos, known as “ojuk” (오죽 / 烏竹) in Korean. The black bamboo is closely associated with the Ojukheon Residence, in which the latter derived its name from due to the large numbers of black bamboos growing in the vicinity. The reverse side displays an image of a painting loosely known as Chochungdo (초충도 / 草蟲圖), or “The Painting of Insects and Plants.” Basically, Chochungdo refers to a genre of paintings initiated and favoured by Shin Saimdang, the mother of Scholar Yi I. Chochungdo paintings, as the name suggests, feature various natural scenes of insects and plants. To be specific, this particular Chochungdo painting by Shin Saimdang depicts a watermelon plant, cockscomb plants, a butterfly and a katydid in artistic harmony. The above is the 10,000 won banknote, equivalent to ₩10,000. First issued in 2007, it is classified as Series VI by the Bank of Korea. As you may already recognize, King Sejong the Great is featured on the obverse side. Looking at the centre of the obverse side, you can also see an image of the Irworobongdo (일월오봉도 / 日月五峯圖), which literally means ‘The Painting of the Sun, Moon and Five Peaks’ in Korean. 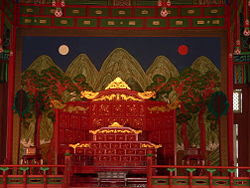 It is basically an imperial folding screen used to adorn the background of the Korean imperial throne in Korean palaces during Korea’s pre-modern era, symbolizing the majesty of the Joseon kings and the imperial court itself. The sun and moon primarily symbolize the king and queen respectively, whereas the five peaks represent a mystical place in Taoism. Besides the Irworobongdo, there is also another image printed in a lighter shade of ink at the centre of the banknote. This is the image of a text excerpt from the second chapter of Yongbieocheonga (용비어천가 / 龍飛御天歌), which literally means ‘Songs of the Dragons Flying to Heaven’ in Korean. It is actually the first work of literature written in the Hangul script, which was developed under the reign of King Sejong. Compiled by Confucian literati under King Sejong, the Yongbieocheonga is one of the most significant pieces of literary work in Korean history, as it is the first ever written text to utilize the Hangul script instead of the Hanja script that was predominantly used in written works of imperial Korea. The reverse side of the banknote displays a picture of the globe of Honcheonsigye (혼천시계 / 渾天時計). Honcheonsigye is a remarkable astronomical clock invented in 1669, under the reign of King Hyeonjong (현종 / 顯宗) of the Joseon Dynasty. The picture displayed on the banknote is only a portion of the actual astronomical clock, in which this portion is a globe or a celestial sphere powered by a working clock mechanism, enabling the clock to indicate the position of the universe at any particular time. While the celestial sphere is depicted with a darker shade of ink on the left, a sophisticated optical telescope from the Bohyunsan Optical Astronomy Observatory (보현산천문대 / 普賢山天文臺, Bohyeonsan Cheonmundae) in the city of Yeongcheon (영천 / 永川) is depicted with a lighter shade of ink on the right. As for the background of the reverse side of the banknote, one can see an image of the Cheonsang Yeolcha Bunyajido (천상열차분야지도 / 天象列次分野之圖), which literally means ‘The Chart of the Constellations and the Regions They Govern’ in Korean. Basically, the Cheonsang Yeolcha Bunyajido is a Korean constellation map produced in 1395 under the reign of King Taejo (태조 / 太祖) of the Joseon Dynasty. The map was produced by imperial astronomers in order to map the exact positions of the stars and constellations. All these images on the reverse side of the 10,000 won banknote illustrate Korea’s illustrious achievements in the field of astronomy, both in the past as well as in the contemporary era. Lastly, this is the 50,000 won, or ₩50,000 banknote. Released very recently in 2009, it is the first 50,000 won note ever to be released and placed in circulation in Korea. As and when this article was written, it is also the highest value banknote to be issued in Korea so far. On the obverse side, a portrait of Shin Saimdang (신사임당 / 申師任堂) is displayed, making her the first woman ever to appear on a Korean banknote. As I’ve mentioned before, Shin Saimdang (1504 – 1551) was the mother of Scholar Yi I, as well as a distinguished Korean artist and calligraphist. Also known with the honourific title Eojin Eomeoni (어진 어머니), which literally means ‘Wise Mother’, Shin Saimdang is held with high regard in Korean Confucianism and is greatly honoured as the ideal and model mother who raised Scholar Yi I to be a reputable scholar in the Korean imperial court. She was born in the Ojukheon Residence, Gangneung, which is, in fact, the same place where her son Scholar Yi I was born. As I’ve also mentioned before, Shin Saimdang was responsible for initiating a genre of paintings known as Chochungdo, which literally means ‘The Painting of Insects and Plants’ in Korean. This was a genre frequently used in many of her artworks. At the centre of the banknote, printed in fainter ink, are two artworks by her, which are the Mukpododo (묵포도도 / 墨葡萄圖) and another Chochungdo painting. Mukpododo, in Korean, means ‘The Painting of Grapes in Ink.’ The Chochungdo painting featured here depicts a natural scene of eggplants. Doubtless to say, banknotes do not only possess financial values, but they also contain remarkable cultural and historical values that many of us tend to take for granted so frequently. 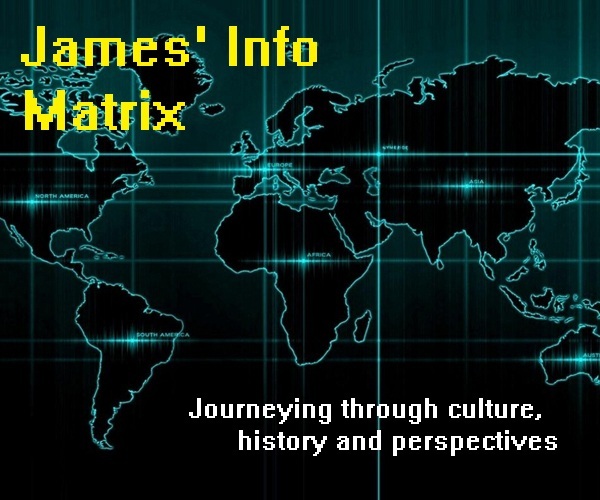 Therefore, the next time you embark on a holiday trip overseas, try spending some time scrutinizing the portraits and pictures featured in the banknotes and coins that you have exchanged for, and you’ll be amazed at how much you can actually learn about the country’s culture and past.